Got a Question About IT Products and Support? The IT Service Centre is committed to providing timely and effective support for many of UBC's online and telecommunications services. The IT Service Centre Help Desk is here to ensure that many of UBC's major online services, such as ResNet and Wireless, work for you. However, the Help Desk doesn't support everything - before you contact the Help Desk, please check what we support , and have detailed information on hand about the nature of your computer problem. We recommend submitting a ticket through our online web form. For urgent issues, please contact us by phone. Note: calls to the UBC IT Service Centre may be recorded for training and quality assurance purposes. 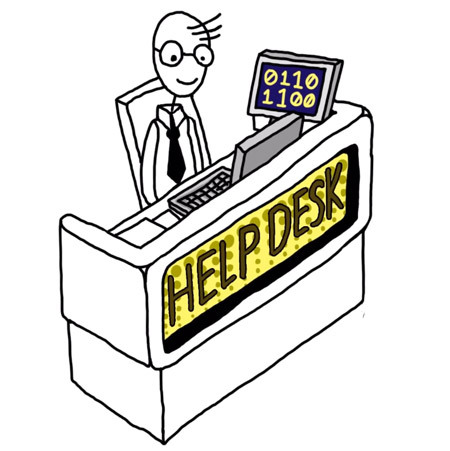 How Can the Help Desk Assist You? For more information on our services visit the service catalogue or contact us. For more information or to purchase software for the Vancouver campus, contact IT Software Licensing. Back to Software Licensing page. Back to UBC Survey Tool page. For other research administration or compliance inquiries, please visit the RISe Contact page. UBC IT's Audio Visual Services team designs, builds, installs, maintains and supports presentation systems and remote conferencing units in learning spaces and meeting rooms across campus. We also install and support digital signage screens, provide equipment rentals for on-campus presentations or events, and sell AV equipment. UBC IT Service Centre Directory provides general phone directory, help and information. Updates to the UBC Directory can be submitted here. We are located in the Leonard S. Klinck Building (LSK), which is at the corner of West Mall and Agricultural road, behind The White Spot restaurant and the David Lam Centre (map). The Learning Technology Hub (also known as the LT Hub) is a central resource where faculty and staff can explore and get support for learning technology tools available to them at UBC.